We develop further a discrete-to-continuum approach to sparse media for which we do not grant the common axiom of permanent identification of the material elements. After refining our previous work on this topic, we focus our attention on the identification of stresses and self-actions at continuum scale in terms of the molecular interactions. Moreover, we introduce and discuss a notion of tensorial temperature by considering a grand canonical statistical ensemble constituted by molecules freely flowing in and out a control volume. 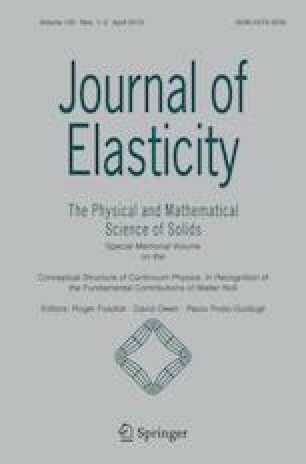 This work has been developed within the programs of the research group in ‘Theoretical Mechanics’ of the “Centro di Ricerca Matematica Ennio De Giorgi” of the Scuola Normale Superiore in Pisa. The support of GNFM-INDAM is acknowledged.